The natural parks of Sierra Mariola and La Safor, Alicante, are home to an astonishingly rich natural variety of plants. To the bees, that’s a botanical smorgasbord, where blossom is available all year round. Their raw wildflower honey is red tinged, with a fragrant, sweetly floral taste – and because they live in a completely uncultivated area, we can be certain that it’s 100% organic. Bona Mel, a family-run business, have been beekeeping for three generations. Years of experience haven’t just made them connoisseurs of the gold stuff – they also profoundly appreciate the vital role bees play in the natural world. 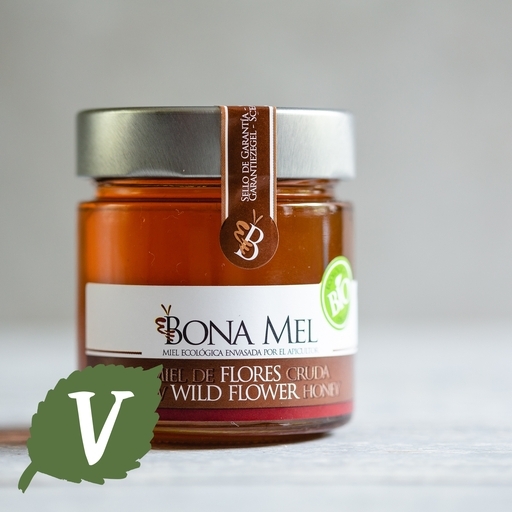 Bona Mel have been certified organic since 1990; their hives across are scattered throughout the natural parks of the Spanish mountains, located at altitudes between 800 and 2000 metres. Because they produce, prepare and jar it themselves, their delicious honey is traceable right back to the hive.